Mumbai: Facing poor passenger response, Jet Airways is planning to suspend international flights to London’s Heathrow airport from Ahmedabad after mid-January. Malaysia Airlines has recently pulled out flights to Kuala Lumpur from Ahmedabad because of the same ­reason. Jet is operating three flights a week from Ahmedabad. The airlines opened this route in March, targeting the Gujarati and non-resident Indian community staying in the UK. “We will withdraw Ahmedabad-London flights from 15 January and will deploy this capacity into Amritsar-London route," said Wolfgang Prock-Schauer, chief executive officer of Jet. “The passenger load factor of Amritsar is comparatively better than Ahmedabad," he added. Prock-Schauer said the airline will route passengers for the UK from Ahmedabad through Mumbai as it is the closest airport for them. However, state-run carrier Air India will continue its daily flights from Ahmedabad to London, according to an official, who didn’t want to be named, claiming “the carrier is having very good passenger load factor." Several international airlines such as Singapore Airlines, Emirates, Air Arabia, Qatar Airways and Kuwait Airways operate out of Ahmedabad. 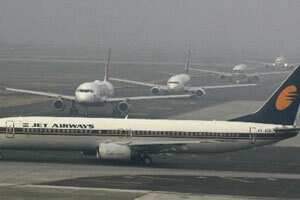 “It was a sensible decision from Jet Airways as part of its prioritization. Since Amristar traffic is increasing day-by-day, Jet would want to enhance the capacity in that route connecting to the UK," said Kapil Kaul, chief executive officer (Indian subcontinent and Middle East) of Centre for Asia Pacific Aviation, an international aviation consulting firm. “There are more connections to other parts of Europe and the US from Amritsar. I am sure at some point of time Jet will come back to Ahmedabad. At present, they can serve Ahmedabad route with help of domestic flights connecting to Delhi and Mumbai, from where passengers can catch UK flights," Kaul added.